Today we tried to learn to knit. As you can see, it was a hilarious process. The only part we got was the first step where you "cast" it onto your needle. She took a glance at the picture and said, "Hey Mom, this is how you do it!" I was completely showed up by my seven year old. So I bopped her on the head with my knitting needle just to remind her who was in charge. Then she poked me. I don't know where she gets it from. We sat there for an hour trying to figure out what to do next. We would get it right and do the same thing the next time and it would be wrong. She thought it was great fun though and asked if we could knit every afternoon. How fun! 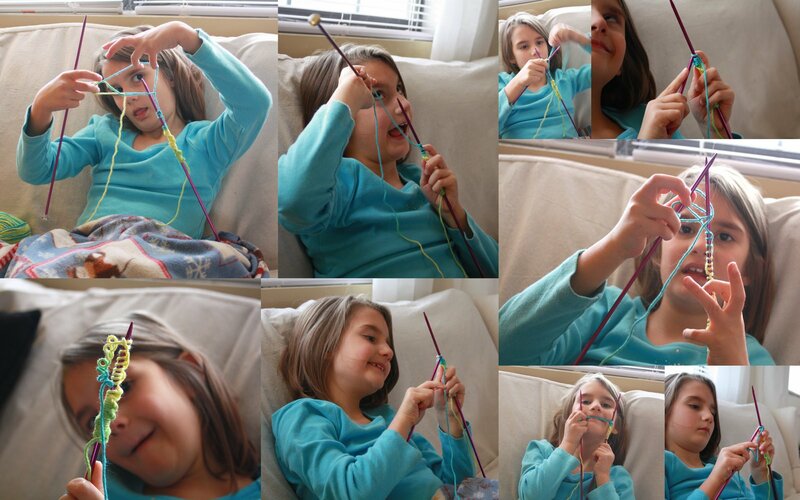 Grace wanted to learn to knit recently, and she's having fun pulling out her knitting every once in a while. I taught myself to knit several years ago. I used Your Guide to Creativity by Jo-Ann http://www.amazon.com/Your-Guide-Creativity-Jo-Ann/dp/0696214393/ref=sr_1_1?ie=UTF8&qid=1295578114&sr=8-1 primarily. Also, http://www.knittinghelp.com/videos/knit-stitch has some videos that might be helpful. Hope it helps!